An "intensely provocative…[and] searing dissection of human behavior" (New York Daily News), Interiors marked a cinematic watershed for Woody Allen. In his first serious drama, Allen's interest in the human condition was not purely farcical and not limited to quick-wit and slapstick gags. Exploring the dynamics of a family in crisis, Interiors is "destined to become a landmark of American filmmaking" (The Hollywood Reporter). When Eve (Geraldine Page), an interior designer, is deserted by her husband of many years, Arthur (E.G. Marshall), the emotionally glacial relationships of their three grown daughters are laid bare. Twisted by jealousy, insecurity and resentment, Renata (Diane Keaton), a successful writer; Flyn (Kristin Griffith), a woman crippled by indecision; and Joey (Marybeth Hurt), a budding actress; struggle to communicate for the sake of their shattered mother. But when their father unexpectedly falls for another woman (Maureen Stapleton), his decision to remarry sets in motion a terrible twist of fate…with tragically unexpected consequences. Academy Awards: Nominated for Best Director; Best Screenplay-Woody Allen; Best Actress-Geraldine Page; Best Supporting Actress-Maureen Stapleton; Best Art Direction-Set Decoration, 1979. And now for something completely different. After years of madcap comedies, Woody Allen had matured during the mid-Seventies when he made Love and Death and Annie Hall. Although those films clearly remained humorous, they departed from the slapstick, "throw everything at the wall and see what sticks" nature of his earlier movies as they featured much more introspective and thoughtful themes. After the grand success of AH, Allen took a much greater leap with his next film: 1978's Interiors. During L&D, he provided some not-so-subtle lampooning of Ingmar Bergman's work, but he goes much farther during Interiors; for that picture, he actually seems to channel the famed filmmaker. And channeled him quite unsuccessfully. Regular readers of my reviews will know I'm not a huge fan of serious, dramatic films that mainly examine human existence or whatnot. However, during my few viewings of Bergman's work, I've been pleasantly surprised by the results; both The Seventh Seal and Autumn Sonata struck me as intelligent and compelling pieces. The latter film almost looks like a blueprint for Interiors. Clearly Allen didn't just rip-off Bergman's movie, since both pictures were made at roughly the same time; in fact, Interiors apparently debuted about two months prior to the opening of AS. However, the similarities were clear, especially in the way both films examined the alienation between mothers and daughters. The main difference stems from realism, which seems rich and deep in Bergman's piece but almost completely lacking in Allen's. Never having been either a daughter or a mother (though I'm occasionally referred to as a "mother"), I can't make this comparison with any great certainty, but when I watched AS, I felt as though I were viewing a documentary; everything about it struck me as honest and true. In regard to Interiors, however, the opposite occurs. Never did I get the impression I was observing real characters who existed in our universe. These folks are all from the Planet of the Whiny Bastards. My, what a dour and unsympathetic group of people! One gets the feeling each and every one of them is on the verge of suicide, and I empathized with that sentiment; after 90 minutes with this lot, I wanted to kill myself as well! Allen took the dark, somber tone of Bergman's work and transplanted it to his world. However, he left out the sense of life that inhabits Bergman's films; no matter how dire the situations appear, they still seem to offer some sense of balance. That almost never occurs in Interiors. In fact, the only non-sour character is Pearl (Maureen Stapleton), an outsider who enters the morose world of the family depicted in the film when she hooks up with patriarch Arthur (E.G. Marshall). Prior to the start of the movie, Arthur leaves long-time spouse Eve (Geraldine Page), and the entire brood still seems radically unsettled by this change. Granted, I don't think their separation caused these folks to become so grim; they probably were always like that. However, Eve's subsequent break-downs exacerbate the problems, and when Pearl comes along, she disturbs the equilibrium further. It's through Pearl that Allen's pretentious symbolism becomes most clear. You see, every other character in the film wears only neutral colors; we see them clad in various tones of grays, browns, blacks and whites, but that's it. Pearl, on the other hand, almost always dons bright red clothing. What a clever way to make her stand out from the crowd! How subtle! Yuck! This move probably seemed clever to Allen, but it's such an obvious way to contrast the characters that it smacks me of freshman English major efforts. Actually, the whole film strikes me that way; the unrelenting darkness and somber tone accompanied with all of the "soul searching" just seems like someone's goofy idea of the way a "serious" film should appear. Unfortunately, it's not, and the result is a grating and shallow effort that completely bored me. When done well, I enjoy this kind of introspective, character-based piece, but Allen shows through Interiors that he had no clue how to create an elegant and effective film in that genre. Stick with what you do best, Woodman, and examine your characters through the comic motif. It worked extremely well in his incisive and tender Annie Hall, but he shows no feel for "the human condition" through Interiors, easily the worst film Woody Allen made in the Seventies. 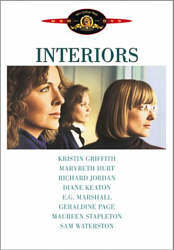 Interiors appears in both its original theatrical aspect ratio of approximately 1.85:1 and in a fullscreen edition on this double-sided, single-layered DVD; the letterboxed image has been enhanced for 16X9 televisions. Only the widescreen side was rated for this review. Interiors provides a drab but generally solid picture. Sharpness looks acceptably crisp and detailed; the bland nature of the photography prevents any really strong definition, but this aspect of the image seemed good. Mire effects are minor, and I noticed few examples of artifacts from the anamorphic downconversion on my 4X3 TV. The print itself displayed some speckling and grit plus a few scratches and blotches, but it generally seemed clean. Interiors presents an intensely bland palette. As I noted earlier, almost the entire film consists of grays, whites, browns and other earthy hues; the only instances of color appear in the clothes worn by Pearl, which usually are bright red. These looked decent but unexceptional. Black levels were also acceptably deep, though they often seemed a bit muddy and flat, and shadow detail was similarly inconsistent. Interiors features a tremendous number of low-light situations, and the film's pretty evenly split between those that are appropriately opaque and the ones that come across as excessively dark. I fluctuated between giving the movie a "B-" or a "C+" for picture and went with the former just due to the age of the material and out of deference to the director's intentions. The monaural soundtrack of Interiors also is tremendously plain. The film offers no score; the only time we hear music occurs during a wedding party. Dialogue appeared fairly flat and dull, though it remained acceptably intelligible. Effects were also thin and reedy, but they lacked any signs of distortion. It's a very mediocre soundtrack for the era, and it gets a "C"'. Interiors lacks significant extras. All we find are the film's original theatrical trailer plus a four-page booklet. The latter includes some decent production notes. Since Allen allegedly doesn't care for supplemental features, this package is typical of all of the DVDs of his work. Interiors itself remains decidedly atypical of Allen's oeuvre, and here's hoping it stays that way. It shows an artist who clearly believed too much of the hype and who took himself too seriously. The movie's a boring and pretentious drag that thinks it offers "truth" but simply buys into various superficial characteristics. The DVD offers fairly good picture, very mediocre sound and almost no extras. This one's best left to the morbidly curious.